Health policy and systems research (HPSR), and health systems in general, have become the subject of intense global interest in recent years. 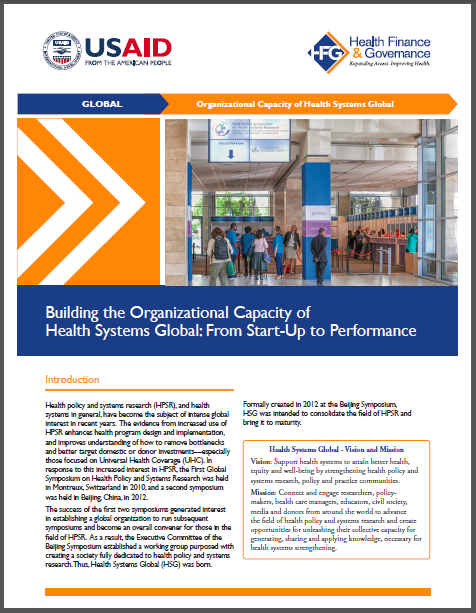 The evidence from increased use of HPSR enhances health program design and implementation, and improves understanding of how to remove bottlenecks and better target domestic or donor investments—especially those focused on Universal Health Coverage (UHC). In response to this increased interest in HPSR, the First Global Symposium on Health Policy and Systems Research was held in Montreux, Switzerland in 2010, and a second symposium was held in Beijing, China, in 2012. The success of the first two symposiums generated interest in establishing a global organization to run subsequent symposiums and become an overall convener for those in the field of HPSR. As a result, the Executive Committee of the Beijing Symposium established a working group purposed with creating a society fully dedicated to health policy and systems research. Thus, Health Systems Global (HSG) was born. HSG is a professional society of health policy and systems researchers, advocates, implementers, and policymakers, whose aim is to consolidate research methods, build capacity in HPSR through networks and communities of practice, promote uptake of research findings in policy and decision-making, and advocate for the field of HPSR and health systems strengthening in general.